The Fence Line: Installing a Fence? Call 811 Before You Dig. Installing a Fence? 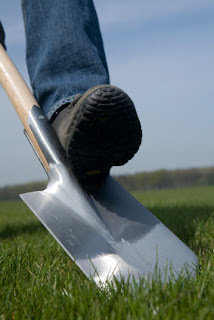 Call 811 Before You Dig. April was National Safe Digging month and with all the goings on at Signet Fence's Online Fence Supply Store, we didn't have a chance to get this post up. But, its better late than never on this important DIY safety topic. 811 is the National Call Before You Dig Hotline. Dialing this federally mandated phone number will get the ball rolling on your DIY Project by alerting your utilities (through your local OneCall center) that you plan to dig on your property. The utilities will then, usually within 2-3 days, send somebody to mark any underground lines. 811 isn't just for building fences; even if all you're doing is planting a tree, you should call. If you don't, you could be playing a very expensive game of russian roulette; one that can not only cost you thousands of dollars, but also endanger your safety. The service is free for homeowners, so there's no good reason not to call before any home improvement project where digging is involved. New Westbury Aluminum Railing Styles.